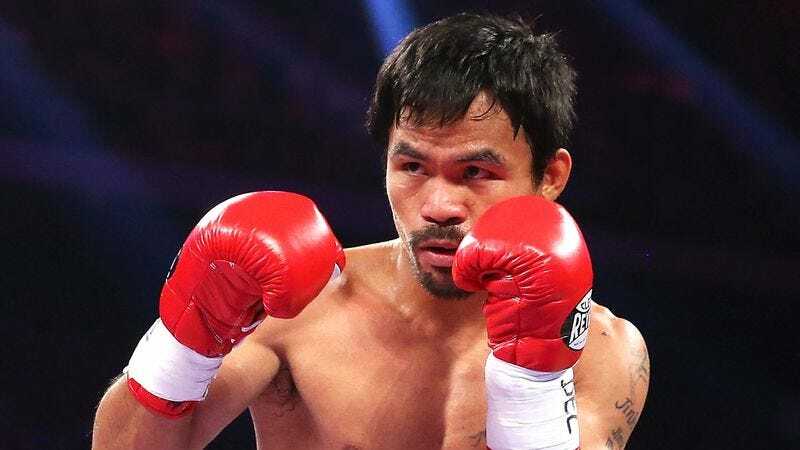 MANILA, PHILIPPINES—As boxing fans around the world turn their attention to one of the most eagerly anticipated bouts in years, reports confirmed Saturday evening that citizens of the Philippines are currently watching one of their congressmen fight a man on television. According to sources throughout the Southeast Asian island nation, roughly the entire Filipino populace has gathered around their television sets in order to witness a member of the Philippine House of Representatives engage in brutal hand-to-hand combat. Reports indicated that the legislator, who has dutifully served the people of the Sarangani province for the past five years, is presently being cheered on by his constituents as he attempts to knock out another man during a live pay-per-view broadcast. “This is one of our most dedicated civil servants,” he added, referring to an individual being pinned against the ropes in front of 17,000 screaming spectators at Las Vegas’ MGM Grand Garden Arena. Sources also confirmed that the man, who earlier this week exchanged threatening stares with his opponent while the two were weighed and then photographed flexing their muscles, successfully campaigned for public office in 2010 on a platform of free education and health care, as well as increased funding for vocational training programs. The 36-year-old second-term congressman also reportedly appeared in a recent promotional video in which he and the person he is currently fighting were depicted slowly walking toward one another in a computer-animated desert. “Go Manny!” Bautista added in a cheer that is just as likely to be heard during one of the man’s televised fights as it is during his 2016 reelection campaign. At press time, the man who by many accounts could someday serve as president of the Philippines was having Vaseline applied to his forehead and cheekbones in preparation for the fight’s next round.